Tons of hot takes on this wintry Tuesday. I installed my first SSL certificate via the new Let’s Encrypt project. It was easier than other SSL certs I’ve requested and installed. This one was all done via the command line. Let’s Encrypt is a free, automated, and open certificate authority (CA), run for the public’s benefit. 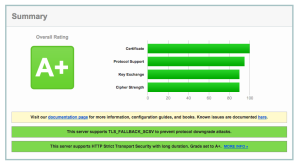 With a few tweaks in Apache, I’m getting A+ scores on Qualys’ SSL Labs test. In May of 2005, I sat in a movie theater in Erie, Pennsylvania, getting ready to watch Star Wars: Revenge of the Sith. The movie was, well, the movie, and I couldn’t help but sit there and be bummed that I’d never have the chance to bring my boys to see a Star Wars movie. They’d never experience the excitement of watching a Star Wars story unspool before them on the silver screen. DVDs, Blu-Rays, and streaming aren’t the same. 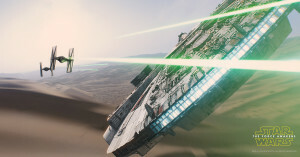 You have to see Star Wars in a theater. You just do. Just before Christmas, I sat in a theater with my two boys and watched The Force Awakens. In that moment between the Lucasfilm logo and the logo appearing on the screen, that heart-stopping moment before the horns blast out, I grabbed their hands. That moment. I want to freeze it, time-lock it, live in it forever. I don’t want them to grow up. It’s happening too fast. The Lucasfilm logo appeared. The music started, and I looked at them. They were smiling, still holding my hand. Speaking of Facebook, their privacy controls have matured to the point that I don’t think people need to change their display names to some combination of a nickname or middle name as opposed to their last name. Instead of being “Laura Jane” on Facebook, you can be your full-name and lock yourself down so people who are not your friend see absolutely nothing about you. 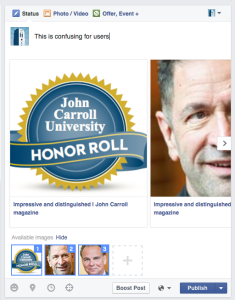 If you are worried about people finding you on social media, don’t be on social media. Ever since I got back from HighEdWeb ’15 in October, I’ve been trying Slack with my integrated marketing team. I’m working on a larger post about it, but I’ve managed to convince my team to use it, which was probably the hardest part of the process. What I like are the integrations. We have Twitter, Wufoo, and Basecamp tied into Slack to give the team constant updates, just like the Weather Channel. If you’re looking for a fun, low-cost entry into VR, I’d recommend checking out the View-Master Virtual Reality Starter Pack. It’s a 21st century version of the old plastic viewer that took those photo discs, but not you put your smartphone in it. The apps that come with it are kind-of lame, but it’s fully compatible with apps and sites built for Google Cardboard, including version of Google Earth. If you have an Android phone, there are some videos in the YouTube app optimized for Cardboard and it’s pretty neat to stand in the middle of an orchestra and looking around while they play. I can definitely see lots of uses for Higher Ed here and I’m starting to get what all the fuss around VR is about.